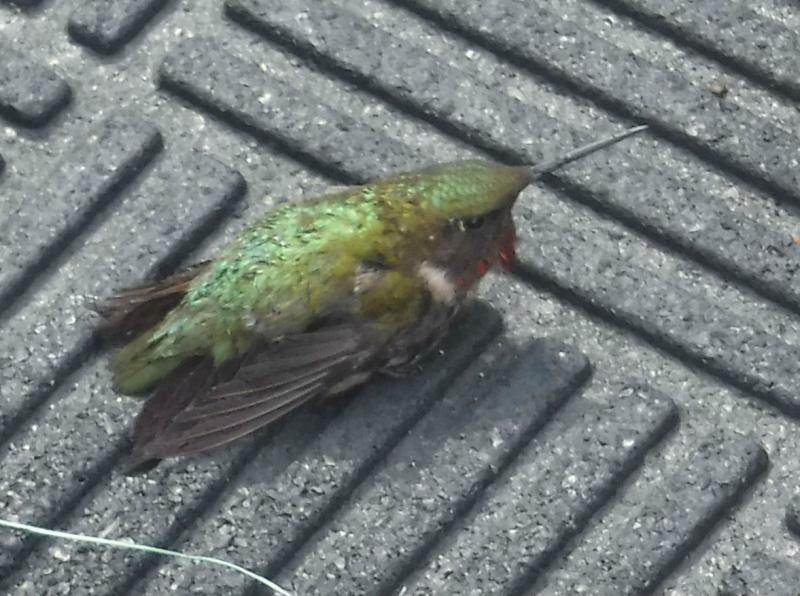 Rescued a Hummingbird this morning. Post subject: Rescued a Hummingbird this morning. I was fishing about 30 feet off of a steep bank. Looked behind me and saw what I thought was a big dragonfly splashing on the surface. Watched it for a minute or two. I even threw my plastic worm nearby, thinking that a bass might be watching from below. When nothing happened, I went back to fishing the shoreline. After another minute or two, I looked back and realized that the "dragonfly" had a beak! I putted over on my trolling motor and saw that it was a small hummingbird. She must have somehow fallen into the water. Her wings were too wet to allow take-off. I extended my rod tip and she grabbed on quickly. She buzzed her wings a few times but couldn't fly away. I deposited her near the stern of my 16-foot boat and there she stayed for the better part of an hour. She did move around a bit, but mostly kept near the sides and deck of the boat. When it started to rain some, I packed up and headed back to the dock. By the time I arrived, my little visitor had flown away. Always told my kids....If.... "Somebody ought to do something" comes up....remember...you are "SOMEBODY" !! You are braver than I! 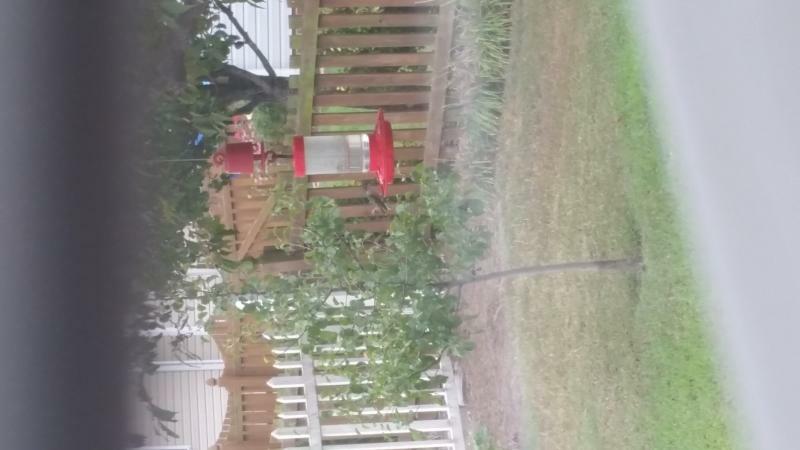 Hummingbirds freak me out! I fish, therefore, I am. I've had to capture one or two that have gotten into the garage and won't fly out the door opening for some reason or another. They just fly in the garage until they are exhausted, then land for a bit, then try again. One I caught was so exhausted it's tongue was hanging out like a dog. I carried it in my hands around to the humming bird feeder and it sat there and drank for a long long time. They are definitely small creatures. Definitely neat little critters, good story and good job rescuing it! I've had sparrows fly into my shop on occasion. I usually can catch them with a towel. Drop it over them and then scoop them up. This little bird grabbed on for life. He must have been on top of the water for five minutes, at least, even after I saw the "dragonfly" at first. He/she was exhausted. "Good on you! ", as the Aussies would say, for that save! Had similar experiences a few time whilst offshore. Once a baby seal climbed aboard my swim platform when I was about 20+ miles out. Poor thing was dead tired, I'm guessing from being chased around by a blue shark ... as a white shark or mako would have gotten the poor soul and ate his azz. He was tiny, for a seal, not even 2' long and he just hung around on the Austrailian board as I trolled the 180 line. After a few hours he dropped off ... and never said good bye, lol! Another time when only a few miles out, we had some unknown breed song bird alight upon the boat, also on a drizzly day, so like your hummingbird experience, they couldn't fly. This one walked around the boat for a few hours and when we were finally close enough to shore for them ... they made a valiant dash for the bank! It was close, as they looked like a returning WW2 bomber with shot out fuselage and only 1 engine working ... though they flew more like a drunker sailor than a pilot ... and we thought it was going to go into the drink a few times - but they made it! Nice save Rich. BTW that is a he. The male has the red color patch on the front of their neck and the female has the same color as their belly all the way up. I recently closed off part of my carport and screened it in. To date, I've had to remove two hummingbirds that didn't see the screen in time and they drilled their beaks up to the hilt so to speak. One of them I was sitting in the swing when he did it, so it was a quick rescue. The other I found as I walked out the front door. He was just hanging there, limp, with his beak stuck in the screen. At first I thought he was dead, but as I gently removed it from the screen and held it in my hands it slowly started to move around. After a while, it seemed to regain it's strength, and finally just flew away. Amazing how light they are, I couldn't even feel the weight of it in my bare hands.